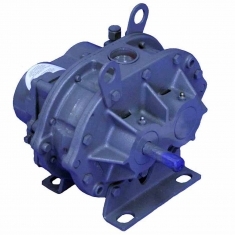 The standard URAI blower features convenient grease lubrication on the drive end. The feet permit easy in-field adaptation to either vertical or horizontal installation requirements and any of four drive shaft positions – top, bottom, right or left hand. All frame sizes are center-timed to allow for rotation in either direction. This URAI blower features Dual Splash Lubrication (DSL). There is splash lubrication at the gear end and the drive end. 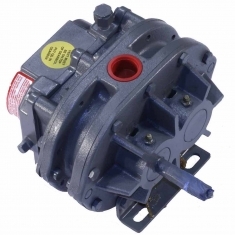 The drive end has two shaft-mounted slingers and the gear end features GE’s exclusive “figure-eight” gearbox design that work together to improve oil distribution and to maximize gear and bearing life. The oil reservoirs feature sight glasses for accurate oil level confirmation. 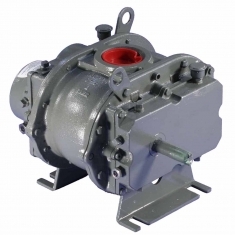 URAI gas blowers feature mechanical seals and VitonTM o-rings. The seal system is designed to meet or exceed gas industry safety standards, including provisions for purge gas in the headplates. The URAI gas blower uses detachable steel mounting feet for adaptation of drive shaft position to meet vertical or horizontal installation requirements. GE refined the standard URAI line using computer-aided design techniques to incorporate the Roots exclusive WHISPAIR jet. The WHISPAIR jet uses shock suppression techniques for noise and pulsation reduction. This exclusive WHISPAIR feature can reduce noise 3-5 dB on typical installations. Like the standard URAI blower, the URAI-J features universal detachable steel mounting feet to permit easy in-field adaptation to any of four positions and grease lubrication on the drive end. This URAI blower combines the WHISPAIR design with the dual splash lubrication feature to offer the longest life and quietest performance of the URAI series.